The Taiwanese companies, on the strength of their fabless company IC sales, first surpassed the European companies in total IC sales share in 2013. However, although the European companies had about $1.4 billion less in total IC sales as compared to the Taiwanese companies last year, the European companies could surpass the Taiwanese companies in IC sales this year as Europe-headquartered NXP absorbs Freescale’s $3.7 billion in IC sales as a result of their merger in December 2015. Korean and Japanese companies are extremely weak in the fabless IC segment with the Taiwanese and Chinese companies displaying a noticeable lack of presence in the IDM (i.e., companies with IC fabrication facilities) portion of the IC market. Overall, US-headquartered companies show the most balance with regard to IDM, fabless, and total IC industry marketshare. At 62%, US companies held the dominant share of fabless IC sales last year, although this share was down from 69% in 2010. 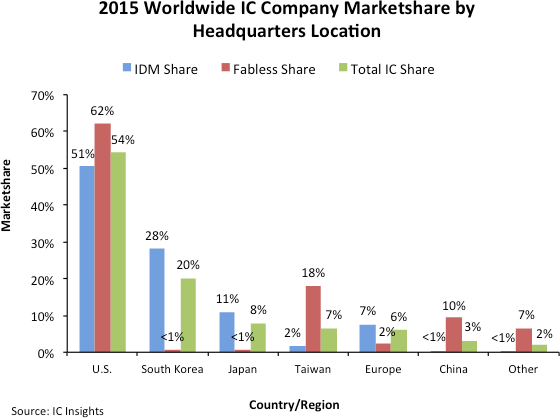 Since 2010, the largest increase in fabless IC marketshare has come from the Chinese suppliers, which held a 10% share last year as compared to only 5% in 2010. In contrast to the situation in the IDM segment, in which the European companies are expected to gain marketshare through acquisitions, the European fabless IC companies lost marketshare in 2015. The reason for this loss was the acquisition of UK-based CSR, the second largest European fabless IC supplier, by Qualcomm and the purchase of Germany-based Lantiq, the third largest European fabless IC supplier, by Intel in early 2015. These acquisitions left Dialog as the only Europe-headquartered fabless IC supplier in the top 50-company ranking and subtracted about $1.2 billion from the total European-headquartered fabless IC sales total, dropping their share to only 2% last year.